In a country of over 7,000 islands, beach lovers will find themselves in tropical utopia when in the Philippines. And since the number of beach destinations can be overwhelming, we’ve narrowed down the search for you. 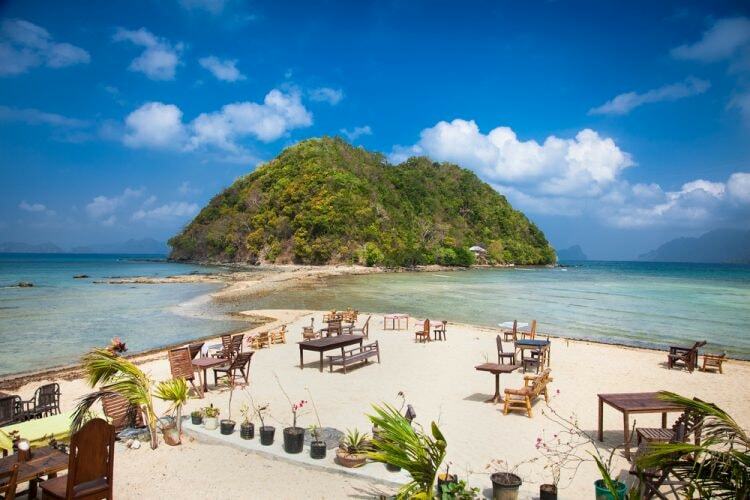 Here are 15 of the most amazing beaches in the Southeast Asian archipelago. The island paradise of Palawan has been crowned “The World’s Best Island” time and again in large part for its northern area, where El Nido and Coron are located. 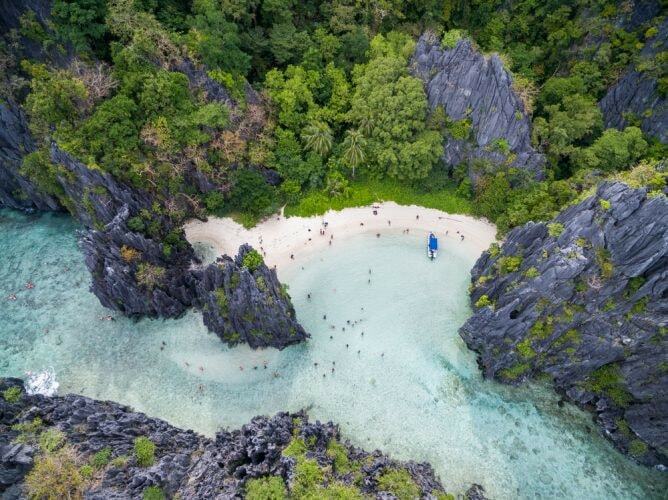 El Nido is studded with gorgeous little islets around Bacuit Bay, reachable by boat, but it also has some of the most breathtaking beaches in the country along its coast. 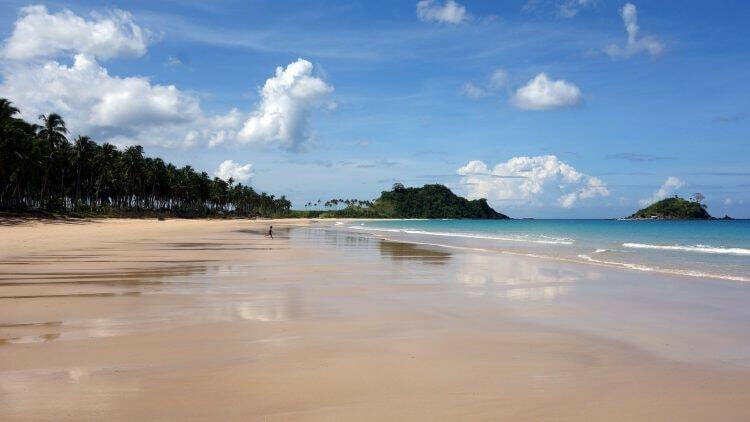 One of these beaches is Nacpan, less than an hour’s drive from the El Nido town proper. Take a tricycle or take the more adventurous route and rent a scooter to brave the roads on your own. Because of its distance from town and the fact that paths en route can get quite bumpy and difficult, this beach doesn’t get too crowded. It boasts a clean, gorgeous stretch of fine, white sand, calm waters, and just the right number of establishments so that it’s accommodating yet not commercially saturated. It’s the image of perfection, so you might just stay longer than initially planned. Like Palawan, once a proud holder of the “World’s Best Island” title is the famous island of Boracay. While the island has gone through massive waves of commercialization in recent years (much to the dismay of many who knew the island before the influx of tourism), its natural beauty is undeniable and still shines through amidst the congested development. White Beach, the longest and perhaps the most popular on the island, continues to draw in the crowds with its soft, powdery sand and iconic sunset views. Everything is accessible at beachfront, from souvenirs and restaurants to water sports and a vibrant nightlife. The extensive stretch is divided into three stations, with Station 1 being the least crowded, so make your way there for a peaceful spot by the sea. 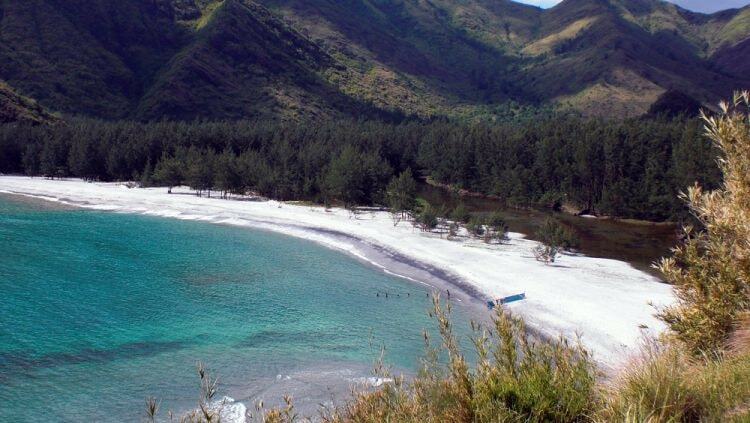 Puka Shell Beach, or more commonly known as simply Puka Beach, is White Beach’s antithesis. It’s where people go to take a break from the hustle and bustle of Boracay’s main strip. 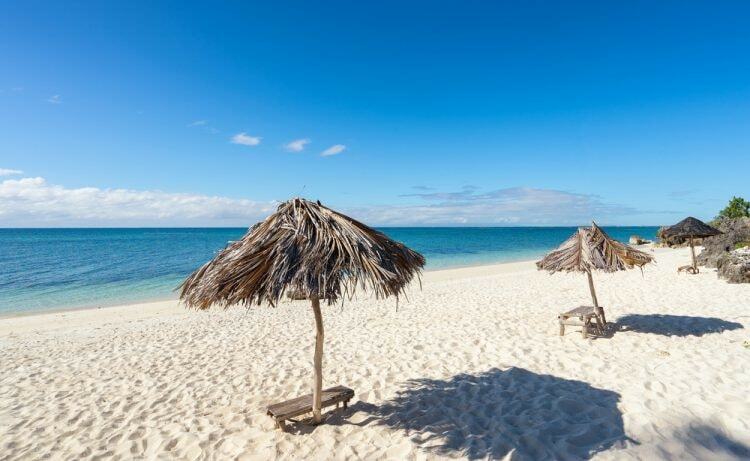 Significantly less developed, Puka Beach draws people in with its rustic charm and natural tranquility. Unlike White Beach, Puka’s sand is notably more coarse due to its blending with puka shells, after which it was nicknamed. The waters on this side of the island also have stronger currents and steeper drops – something to consider when going in for a swim. 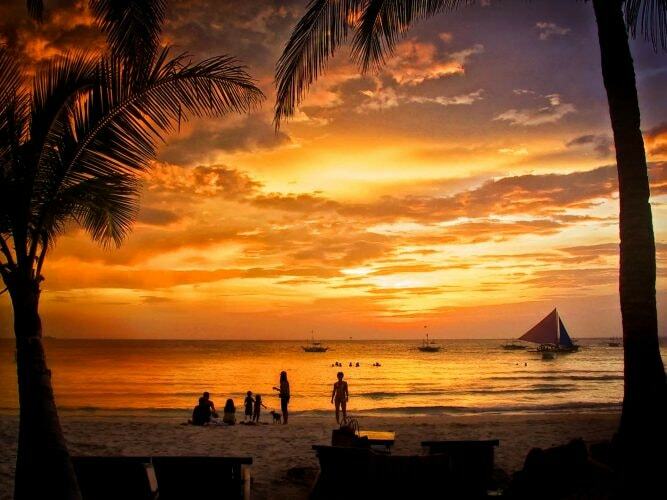 Many compare Puka Beach to the tranquil Boracay of decades back, so pay it a visit to experience “Old Boracay.” Just try to pack some drinks and snacks as the few establishments here sell at higher prices. South of Bantayan Island, in the municipality of Santa Fe, sits a small, secluded beach that lives up to its name. 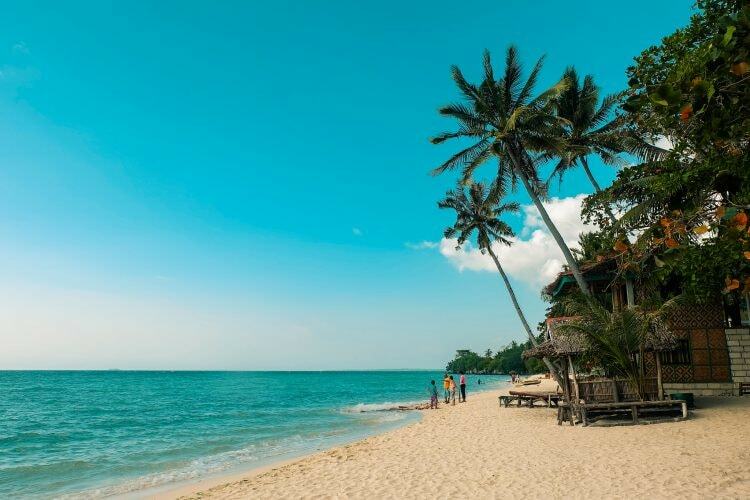 An unassuming little piece of paradise, this beach houses a few nipa roofs, wooden benches, and a pristine coastline. Towering palm trees and grassy areas complete the picturesque scene, and minimal visitors allow you to enjoy it all in utmost serenity. 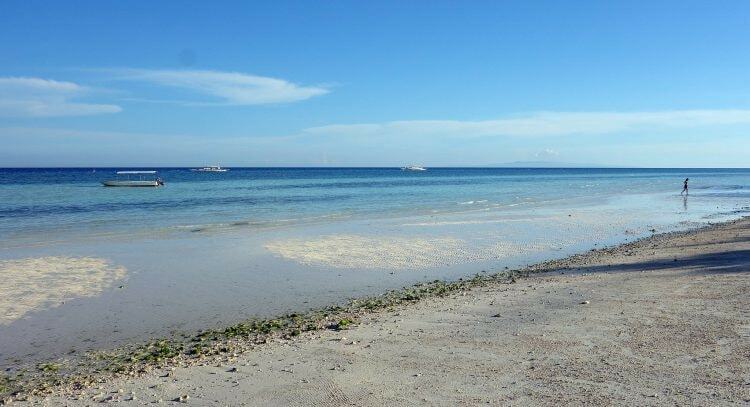 While Alona Beach is more well-known, many consider Dumaluan as the best beach on Panglao Island. The water is calm and rather low, making it kid-friendly for those traveling with their little ones. The beach is clean and spacious and is lined with resorts, so you’ll have places to retreat to for a good meal or a refreshing cocktail. While there is a public area, visitors can also enter through some of the resorts for a minimal fee and rent out one of their beach cottages, among other amenities. The public beach area is very popular among the locals and can get busy over the weekend, so consider splurging a little to access private resorts’ beachfronts for a more relaxing stay. Don’t let this beach’s crowds discourage you from including it in your El Nido itinerary. Its popularity and tendency to draw in tourists by the boatload stem from good reason. A stunning work of nature, Hidden Beach is safeguarded by magnificent limestone formations, shaping it into a cloistered cove. Fronting the cove is a massive karst wall, further hiding it from unsuspecting visitors approaching aboard their boats. Plan your visit strategically with your tour organizer and avoid this beach’s peak hours to truly appreciate it in solitude. 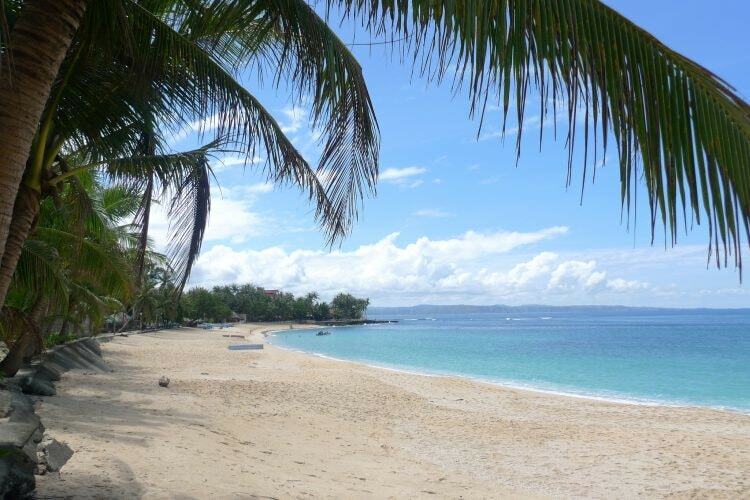 At the northernmost tip of the great island of Luzon are the beaches of Pagudpud. 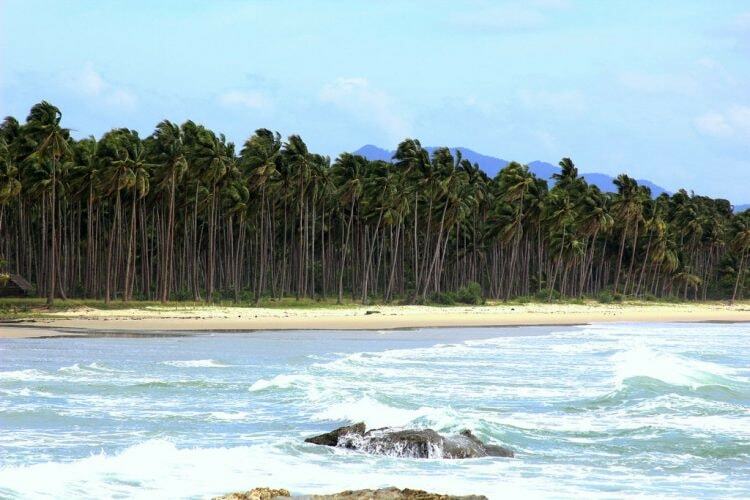 Arguably the most beautiful of those that line its coast is Saud Beach. Well-kept and minimally developed, Saud’s allure is in its untainted natural features. The sand is fine, the beach is vast, and the sea an immaculate shade of blue. Off in the distance, the province’s famous Bangui windmills can be seen, a unique charm enriching the already lovely view. Anawangin Cove is a highly popular camping destination for city-folk seeking to escape the restless Manila pace. They go off the grid and get back in touch with nature through pitched tents, only the bare necessities, and zero telecommunication signal. The cove’s make-up is as interesting as it is beautiful, being a pleasant aftermath of an otherwise tragic moment in Philippine history. The Mount Pinatubo eruption of ‘91 devastated a considerable area of the country, so nobody expected that the resulting ash fall could turn what was then a rocky coast into the sandy beach Anawangin is today. And even more surprisingly, Agoho trees flourished into a lush forest that now provides campers refuge from the beach’s scorching heat. A hiking trail up a hill that overlooks the entire cove allows visitors to see Anawangin in all its raw beauty. 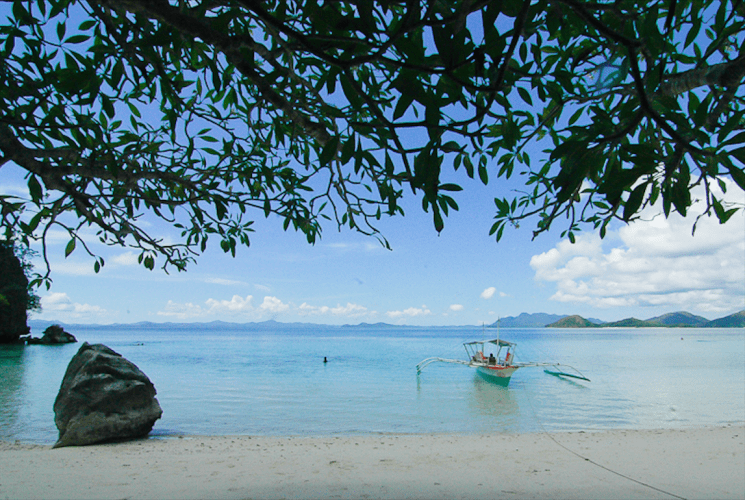 A common lunch stop on the Coron island-hopping tour, Banul Beach is a sight to behold. Its powdery white sand, crystal-clear waters, and massive limestone backdrop will make you want to lounge and stay for more than just a meal. Its modest size only adds to its charm. With a few cottages and wooden tables set up, it’s a great stop for groups who’d like to take their sweet time and just enjoy such a picture-perfect setting. Like Nacpan, Marimegmeg Beach is reachable by road from the El Nido town proper and is also a brilliant place to catch the sunset. What visitors love about this beach is its overall vibe. Imagine enjoying daybeds, beanbags, and swings, cocktails, good music, and the sunset, all whilst having the sea a stone’s throw away. 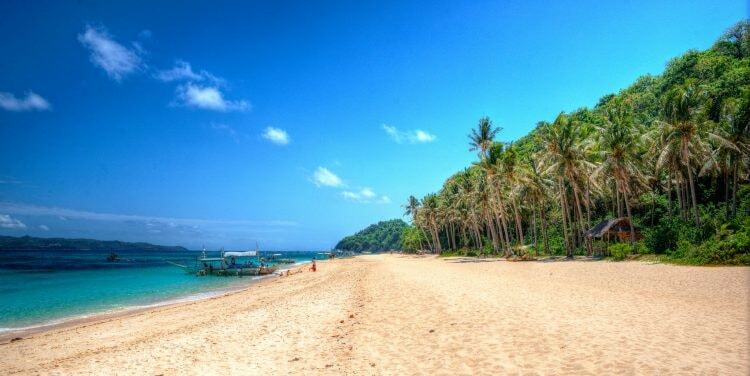 Being only a 15-minute tricycle ride from the El Nido town proper, tourists gladly make the short trip and kick back on Marimegmeg Beach and bask in its ideal tropical energy. 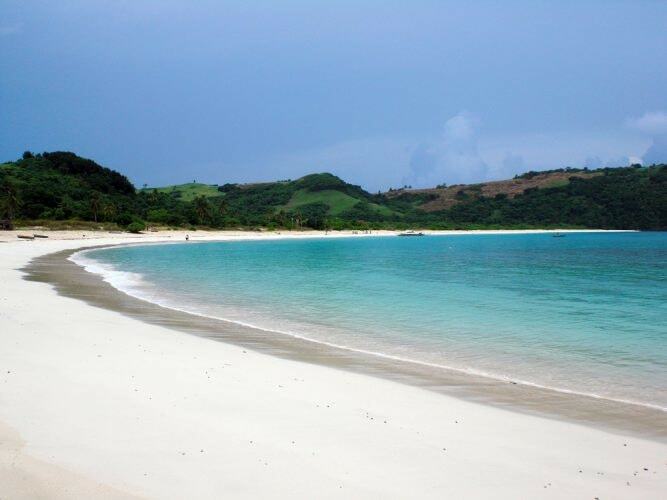 Another pristine beach which has been compared to the Boracay of decades back is Mahabang Buhangin on Tinaga, one of Camarines Norte’s Calaguas Islands. This beach, whose name literally translates to ‘long beach’, is popular to local tourists for its soft, light sand, clear blue waters, and surrounding lush greenery. Commercial establishments here are few and the beach makes for fantastic camping grounds. Pack your camping gear or rent one of the cottages lining the beachfront to stay the night and enjoy the gorgeous beach for longer. There are also a lot of activities to fill out a day such as island-hopping to neighboring islets, hiking up nearby hills for breathtaking landscapes, and going further inland to discover the island’s local community. As Lambug is a public beach, it is well-known among the locals and can get busy over long weekends and holidays. Drop by on a regular weekday, however, and you’ll see what makes it so great. A long shoreline of creamy, fine sand is lined by quaint accommodations and cottages, but it’s also a great beach to pitch a tent, get a bonfire going, and camp out. It’s unpretentiously serene, clear of fancy establishments and hordes of tourists. Its simplicity, seclusion, and easy-going atmosphere make it a tempting retreat from bustling Cebu City. The high-profile beaches of places like Boracay and Palawan are no doubt astonishing. But this has come to mean having to share them with loads of other tourists at any given time too. If a deserted paradise is what you truly want, you can be sure an archipelago comprised of over 7,000 islands still has a few of those tucked away. 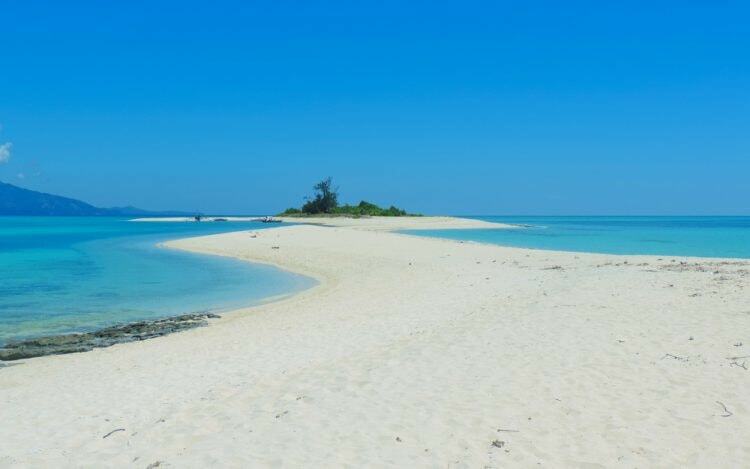 On a remote island in the province of Romblon is a stunning bright stretch of sand called White Sand Beach. The island, Cresta de Gallo, is as tranquil as they come. With only two of its caretakers inhabiting the island and little tourism, this will definitely feel like your very own slice of paradise. There is virtually nothing on the island so everything you might need, you’ll have to bring with you on your visit. A dazzling beach surrounded by sensational aquamarine waters and ultimate peace — you might have to see it for yourself to believe a place like this still exists. Warm, white-sand beaches abound in the Philippines and they’re what many tourists come to see. But that’s not all there is. 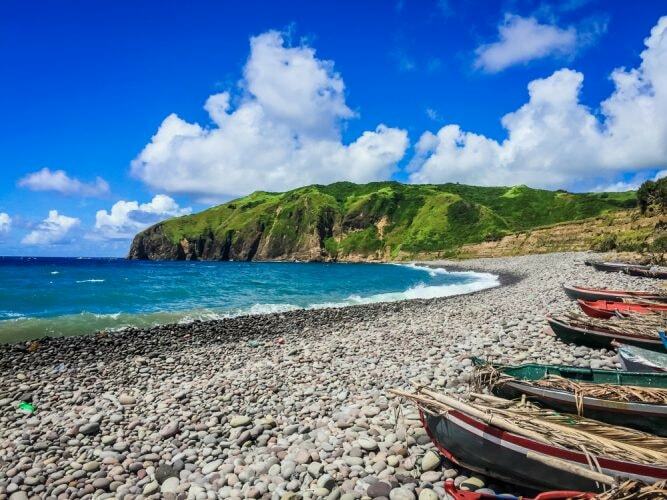 On the country’s northernmost province of Batanes lies the striking Valugan Boulder Beach. The product of a Mt. Iraya eruption over a thousand years ago, Valugan is covered in smooth rocks and boulders, creating a superb landscape one doesn’t see very often in a country like the Philippines. The views – a picturesque contrast of colors from the grey rocks, deep blue ocean, and green rolling hills – are absolutely breathtaking and a treat for anybody who enjoys taking photos. While Palawan is mostly known for El Nido and Coron, the fishing village of San Vicente is also home to beautiful, albeit underrated, beaches. One of these, recognized as the longest white-sand beach in the country, is Long Beach. Stretching 14 kilometers long, this extensive strip has fortunately been left alone for the most part. Devoid of crowds and commercial development, this beach is a great choice for anyone who has grown tired of tourists in the province’s more famous stops.